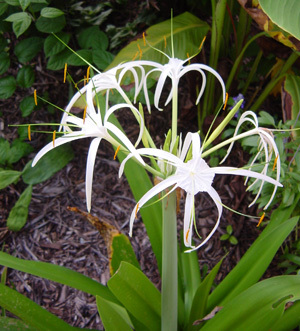 The Spider Lily (Hymenocallis)is native to the Mississippi Valley and Southern United States, down through Central America and the Caribbean. It grows well in full sun to part shade and it blooms best in wet conditions where the bulbs do not dry out between rain or other waterings. This plant is suitable for water gardens or wetlands. Propagation is by bulb division or seeds, although you'll have much better success with the bulb divisions. The flowers are white with long slender petals, giving a very delicate spidery effect at the top of a long hollow stem that will reach two to four feet in good conditions.